A common argument, albeit without any basis in morality, against redressing injustices is that they belong to the past. Hence, African Americans have never been indemnified for the slavery their descendants suffered, and the White slave-owning descendants continue, in many cases, to prosper based in large part on the largess extracted from unpaid past labor. Furthermore, if people can stop bending themselves around the obvious and straight on acknowledge the genocide against the Original Peoples of the western hemisphere, they still likeliest will evade the killing and dispossession and justify the status quo because what happened was in the past. However, injustices have always had a starting point in the past with the injustices differing as to which point in the past they had their start. The Zionist dispossession and genocide of Palestinians is of a more decidedly recent starting point than 1492. So unfortunately genocides are not confined to the past but still occur in our supposedly enlightened times. Abdul Haq al-Ani and Tarik al-Ani tackle a very recent genocide: a genocide that is concealed by the corporate or state media of the West, the genocide perpetrated in Iraq by the United States and aided by the United Kingdom and the coalition of the killing. Amid all the words written about the evil that beset Iraq and destroyed around a million lives; uprooted millions of other lives; destroyed the infrastructure that employs people, feeds people, is responsible for their sanitation, healthcare, and education; obliterated a vast repository of knowledge, history, and culture; then imposed an embargo to prevent the rebuilding of the what was destroyed is the word usually missing: genocide. The evil was based on a lie — the lie that Iraq possessed weapons-of-mass destruction. This US-UK lie was then — in a preposterous inversion of morality and logic — used to massively destroy a country, its people, its society, and its culture. 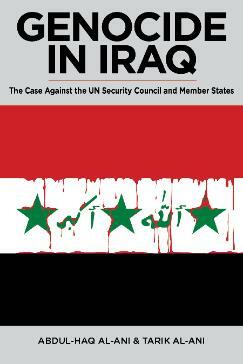 Abdul Haq al-Ani and Tarik al-Ani have written a very readable legal tour de force: Genocide in Iraq: The Case against the UN Security Council and Member States (Clarity Press). As is evident from the title, Haq al-Ani and Tarik al-Ani do not let the United Nations Security Council or the unprotesting member states of the UN off the hook for the West’s genocide in Iraq. Haq al-Ani and Tarik al-Ani begin with self-incriminating quotations by American officials and by providing the historical backdrop of Iraq, the treachery of Sykes-Picot, how Iraq was geographically blocked from ready access to the Persian Gulf, how Kuwait was created by British colonial fiat, how a monarchial client regime was installed in Iraq, and how Iraq’s oil wealth was plundered for British capitalist profit. The history continues with the overthrow of the Iraqi monarchy, the internecine battles for power in Iraq that consolidated under the Ba’ath party and the rule of Saddam Hussein. The comparatively rapid economic and social development of Iraq under the Ba’ath is detailed. The context is important because Iraq is a country that would not recognize Israel as a legitimate state (and neither do many other Muslim states, and why should a state formed by European Jews dispossessing the indigenous Palestinians and maintained by perpetual occupation, oppression, and warfare against neighbor states and an Israeli society wherein 20% are discriminated against by the majority? ), it had nationalized its oil for the profit of its own people (not for Big Oil), and it had developed its economy along socialist lines. How to destroy Iraq? Saddam Hussein had a large hand in it. He foolishly decided to solve differences with Iran militarily. Hussein then fell for the American trap in attacking Kuwait, believing the US had no opinion on Arab-Arab disputes. A UN-authorized war to dislodge Iraq from Kuwait and massively destructive sanctions followed. Regardless of what explanations and justifications were given for the military assault on Iraq in January 1991, in reality, the destruction began on 6 August 1990, the day the Security Council adopted resolution 661 which imposed the most brutal total blockade against Iraq. Never before has a state been subjected to such collective measures, a blockade, not dissimilar to the sieges of the Middle Ages, which prevented everything from going in or out of the country. A snapshot of the genocide was provided by the authors describing the targeting and destruction of the Amiriya civilian shelter. The bombs penetrated the meter-deep layer of earth, passed through one meter of reinforced concrete slab, through the top floor and through another meter of reinforced concrete floor slab to the lower floor. The impact of the bomb caused all the water, fuel tanks and boiler to explode, filling the lower floor with a mixture of boiling water and fuel to a depth of two meters. All the medical staff were killed instantly and the emergency power supply was destroyed, rendering all life-supporting systems inoperative. On the top floor the bomb generated a tremendous heat estimated to have reached some 4000 degrees. The people were incinerated. At the time of the attack there were over 1500 civilians in the shelter. Out of those people only 11 persons are known to have survived after suffering different degrees of wounds, burns and psychological trauma. Whole families were wiped out, as could be seen afterwards from their locked houses in Amiriya. The bodies of the medical staff were found floating in the water-fuel mixture of the lower floor. The caretakers of the shelter claim that the black, burnt walls still have human skin and flesh stuck to them. Perhaps the most sinister part of all this is that the world did not realize that the war had not ended; it had only taken another form. This time the weapon was the blockade, which deprived the people of Iraq of access to food, medicine and the basic needs of a normal life. Genocide in Iraq details the lethality of sanctions. The sanctions also revealed racism. Haq al-Ani and Tarik al-Ani note that the UN spent more of feeding dogs used for demining operations ($400 per dog per year) than on Iraqis ($170 per person per year). In fact it is submitted here that the imposition of sanctions on Iraq, when it was no longer a threat to international peace, was itself an act of war or aggression and by imposing the sanctions, the Security Council was itself guilty of breaching international law. 1. Making civilians the object of attack is a grave breach of the Protocol. 2. Grave breaches of the Protocol are regarded as war crimes. 3. There is no scope for introducing the balance of any military advantage that could result from an attack on civilians as a mitigating or annulling factor in determining whether war crimes had been committed. 4. The Security Council would have committed a war crime in imposing total sanctions against Iraq. The irony here is that while both appreciated the fact that the UN had become entitled to intervene to prevent genocide, they did not envisage the possibility that the UN itself could end up implementing conditions which lead to genocide as we submit it did in imposing total sanctions on the people of Iraq. … we need to make it clear here, that as a practicing lawyer and commentator and researcher, we believe that nobody— including no entity—ought to be above the law. It should not be possible for states or combinations of states to commit major jus cogens crimes and be relieved of culpability under the pretext that they operated collectively in whatever guise—that of institutions or of treaties, or of intergovernmental entities, whatever the covering entity might be, any more than for individuals to do so, as officials of states. This necessarily means that the United Nations Security Council could be in breach of International Law and therefore ought to be liable to questioning about its decisions. The authors decry hypocrisy and call for a fair playing field in international law. If it is alleged that it was because Iraq invaded Kuwait, then we should remember that both Israel and the USA had invaded so many countries in the 20th century. Egypt invaded and annexed the Hala’ib triangle from the Sudan, an area which is larger than Kuwait, without a word of objection from the so-called world community. Genocide in Iraq poses a farcical paradigm that underscores the importance of its message. As it stands now, alleged genocidaire, the United States, is pushing for regime change in Syria. The inevitable result is another cataclysmic loss of life. Alleged co-genocidaire, the UN, is “mediating” the “situation” in Syria. Genocide in Iraq is a must read for those who believe in justice and the equal application of law for all. It is also a must read for those who seek to understand the attack on Iraq from the Iraqi perspective — not just western media demonization. Abdul Haq al-Ani and Tarik al-Ani present their case and leave readers to render their verdict. This article was posted on Wednesday, May 1st, 2013 at 8:02am and is filed under Book Review, Genocide, Iraq, Justice, Racism, Sanctions, United Nations, War Crimes.